KZ has developed a new version of Pohl's Xtra labeled Pohl's Xtra Special. The new version is specially designed for ultra low nutrient systems and/or aiding with bringing back the natural deep coloration of otherwise pale corals. 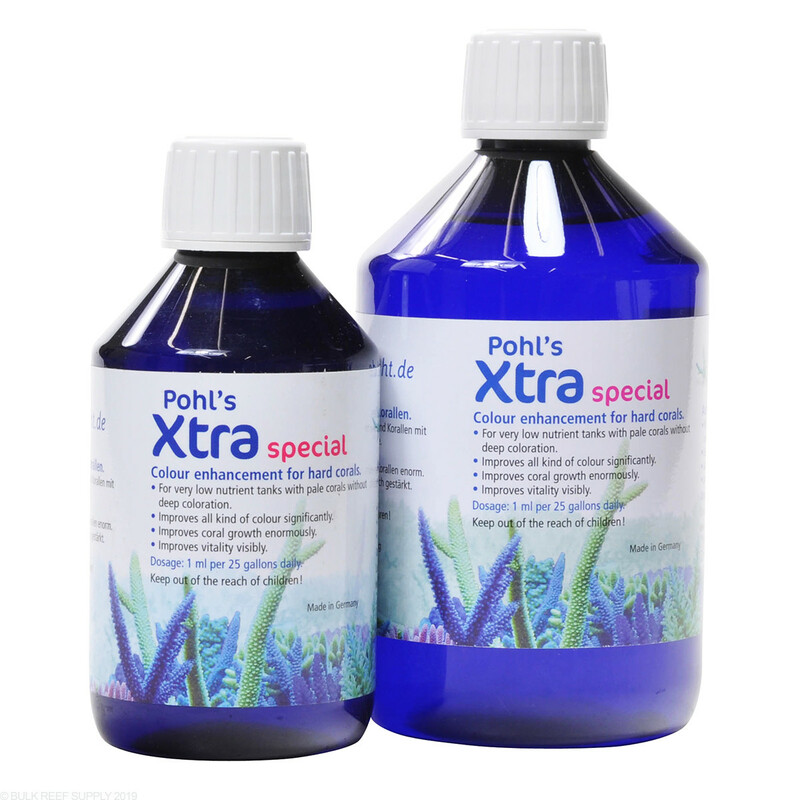 Continuous development of the Korallen-Zucht product line has produced this version of Pohl's Xtra Special which has a special blend of the most effective KZ additives for improved coloration. Designed specifically for pale corals and ultra low nutrient systems. Improves all types of color significantly as well as improves growth rates and coral vitality. One of the more popular products in the KZ line. Dosing: 1 mL per 25 gallons daily. Do not exceed recommended dosing amount. As an avid SPS collector and farmer I decided to try this after having a moderate amount of success with Coral Booster and Coral Snow (the later of which I now make DIY for much much cheaper)... I decided to go with the smallest size just as a trial run, dosing about 50% recommended. After using it all up over the course of a couple weeks in a 450g system compromised of a 150g display + 2 raceways, I'm pretty convinced it has very beneficial effects on color and possibly growth in systems that struggle to keep appropriate nutrient levels (3-5ppm nitrates and .2-.3ppm phosphate). I will keep using this product as long as I see sustained benefits of fantastic color improvement in corals and will recommend it to anyone running a low nutrient system or ULNS. Unless you have undetectable levels of NO3 do not use this product. It contains NO3 and it is not stated on the label. It has only been 2 weeks, but I can say that my purples have seemed to get richer and I can surely see an improvement in overall coral coloration. I use the whole line of zucht because it has proven itself to me and works great. I use the whole line of zucht, and wouldn't use any other because it has proven to me that it works great. As a user of the zeovit system, this product can make a huge difference in the appearance of corals. Starting off I had some very pail corals due to lack of nutrients. After dosing this product every other day for 2 weeks all the color has came back. Very good stuff. Im running zeovit on a 200 gallon reef tank and was having trouble with purples and a few validas being too much on the pale side. After doing some web surfing I decided to give extra special a try. After about 2 weeks of dosing opposite of pohls extra I can definitely say the color in those corals are coming back. 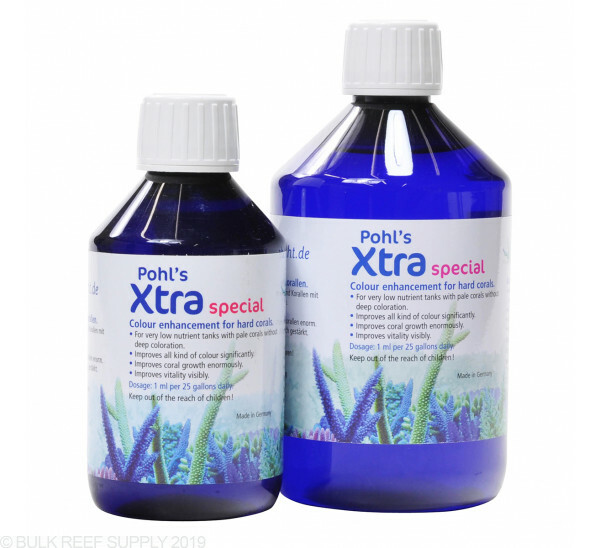 If you are running rox carbon I recommend dosing extra special to ensure your corals are getting enough nutrition. This product, while expensive, is great for tanks that are very clean and need nutrients. It will add a bit of phosphate but it is negligible as long as you maintain quality water. Great for SPS. I noticed significant growth in my acro colonies. I have dosed a 250ml bottle of this additive and haven't noticed any effect on my corals. After I stopped dosing I didn't notice any impact. It just doesn't really seem to do much. This is an excellent product for what it claims to be...an sps color enhancer. A noticeable difference was detected after just 2 doses. Expensive, but worth it if you're an sps reefer. In fact, compared to many things in this hobby it's rather reasonably priced. The two Poh's Xtra formulas are variations of the same supplement, with the Xtra Special being formulated with an extra boost for ultra low nutrient systems where color fading tends to occur. I would choose one or the other based on your system setup and needs.